Great job you did! and thanks for sharing. Working with your code help me a lot to start. But i found a bug, that i manage to make a dirty fix when working with multiplayer. Somehow if are more users on the field. The server send the same positions for all of them. I think you have a better way to do this but. What i did was to clean and populate new points for each one. While saving it and increment on a string text file. Hope it helps other people ho are trying to do the same. Sorry dude you web site is deleting few lines. If you want to know send me an email. Thanks for sharing and glad you found the original post useful! 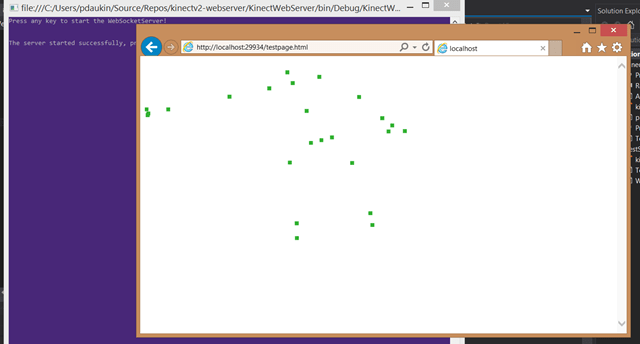 Just to be clarified, your project is collecting kinect data from the server side or the client side? 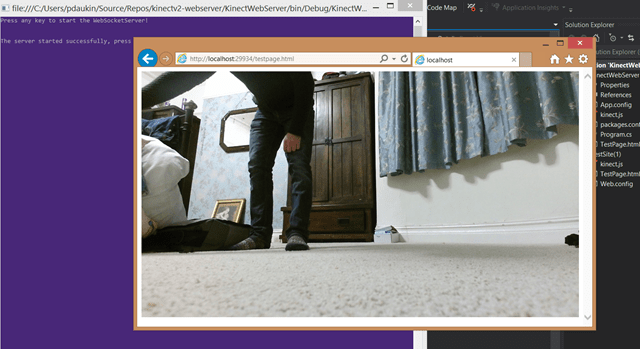 I am searching about how I could read kinect sensor client-side only. At first sight I thought you did it, but looking at the code I think you created a webservice to send the data for the browser rendering only is that right? It is using a websocket connection with the websocket server running on the client computer. Can you give more details about ‘read kinect sensor client-side only’ – what are you trying to do?